In this short summary, we investigate the importance of learners’ emotional involvement in self-directed learning. We begin by briefly examining the literature related to affective factors in self-access language learning. We then describe two examples of institutions with self-access centres that place particular importance on affective factors in courses of self-directed study. The first example is in a university in Japan, where affective strategies are introduced through self-directed learning modules. The second example is in a university in Mexico, where educators are investigating how feelings about self-access language learning can change over time. Affect refers to the emotions, feelings, and attitudes that individuals bring to the learning experience and the role these play in motivation (Dörnyei, 2001; Hurd, 2008). As Hurd (2008) points out, findings in neuroscience indicate that both affect and cognition are fundamental and interdependent aspects of human brain functioning. The role of affective factors in learning has been outlined by Schunk, Pintrich and Meece (2008). Affect has a bearing on the way information is encoded in the brain and subsequently recalled; the kinds of cognitive strategies that will be used; attention and working memory; and motivation. Affect can be regulated through the use of affective strategies (White, 2008), such as reducing anxiety, encouraging oneself and monitoring one’s emotions (Oxford, 1990). Successfully using such affective strategies can yield cognitive benefits in terms of greater control over learning outcomes (Benson, 2001). Hurd (2008) concludes that affective strategies are as crucial as cognitive and metacognitive strategies for successful language learning. Although affective factors may be especially relevant to independent language learners, research into affect in language learning has tended to focus on classroom learning (Hurd, 2008). In particular, maintaining motivation and dealing with anxiety are crucial issues for learners in independent settings because of the lack of access to a teacher and peers. Hurd (2008) offers the view that online learning technologies can help reduce anxiety and increase motivation in learners engaging in distance modes of independent learning because they are able to control the pace and output according to their needs and preferences. In addition, there are opportunities for collaboration and support from others afforded by the technology. Furthermore, the role of the tutor or learning advisor in providing feedback, advice and encouragement, is vital. The study by Hurd (2008) offers Think-Aloud Protocols (TAPs) as one way to investigate affect and strategy use among language learners (in this case, students on a distance program). In addition, there are other ways in which the importance of affect in self-access learning programs can be studied, as the examples in this summary will show. In the following section, we share two examples of institutions that are particularly concerned with the affective side of independent learning. 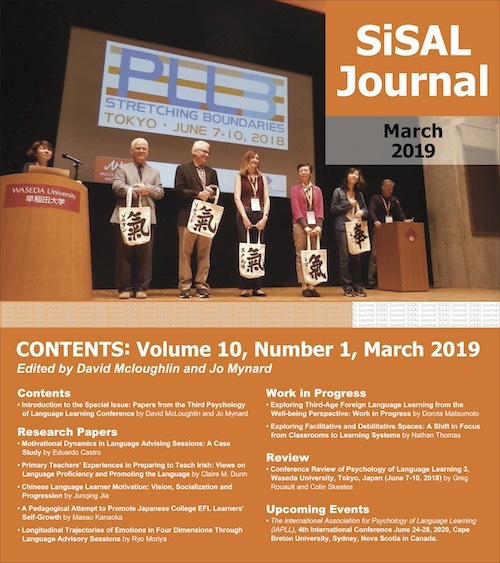 Students at Kanda University of International Studies (KUIS) have the option to take self-directed learning modules through the Self-Access Learning Centre (SALC). Some of these modules allow students to gain a small number of class credits; others are not credit-bearing, but might help them to prepare for an external exam (see Morrison, 2011). The modules are designed to promote autonomous language learning in two ways: the First Steps Module (see Noguchi and McCarthy, 2010 for a description) provides students with tools and strategies to direct their own learning; and subsequent modules offer them the chance to design and implement their own self-directed learning plans. Students are assigned a learning advisor to support them in drawing up their learning plans and working on them over a (typically) eight-week period. through explicitly raising awareness of the importance of affective factors. The First Steps Module consists of weekly activities organised by weekly themed units. One of the units is “Affective Strategies” in which learners learn about internal and external motivation and reflect on ways in which they can maintain motivation for self-directed learning. The other key theme in the unit is anxiety reduction. through embedding the concept of affect in students’ learning plans. The learning plan at the end of the First Steps Module and at the beginning of all other subsequent modules is built around a SURE+E model (Study-Use-Review-Enjoy-Evaluate). Learners are encouraged to ensure that their weekly activities are not only useful for attaining their language-learning goals, but are also enjoyable. through the support offered by the learning advisors (LAs). In addition to meeting learners periodically throughout the module period, LAs write weekly comments on their assigned students’ independent work. These comments are designed to help the learners think more deeply about the learning process, activate cognitive and metacognitive processes (Mynard, 2010), and maintain the motivation to continue their independent study. (4) by using encouraging words. (6) the way in which emoticons, pictures and stickers were used. Learners studying languages at the Universidad Veracruzana (UV) can take regular class-based courses or the equivalent SALL courses consisting of between twelve and fifteen units in a semester. The course is semi-guided and is managed by a team of eight learning advisors using a portfolio system (see Valdivia, McLoughlin & Mynard, (forthcoming) for a description). As is the case at KUIS in Japan, affective factors are considered to be crucial for successful independent learning at UV. The learners need to become accustomed to a new way of learning and often begin with misconceptions, misunderstandings, and fears of what they will encounter. Affective factors are investigated during the period of self-access learning. At the end of each study unit, learners answer questions that are designed to stimulate reflection and deeper thinking about the learning process. One question asks: “How have you felt about working at the self-access centre?” The word ‘feel’ is used deliberately in the question in order to focus learners’ reflection on the affective dimension of their learning experience. (5) those indicating avoidance of commitment to SALL. The researchers at UV observed that over time, students’ comments seemed to show that they were becoming more comfortable with the SAC experience. In addition, there were some encouraging signs of awareness raising on the students’ part about their role as independent learners: the repeated use of apologies, not merely as excuses to justify themselves, but as an honest analysis of the circumstances that limited their performance; references to the advantages and disadvantages of classroom and SAC learning; and the use of terms such as ‘irresponsibility’, ‘adaptation’, or ‘sense of duty’, which may have indicated a growing awareness of the learning process. In this summary we have attempted to highlight the importance of affect in self-access courses by sharing some examples from our practice. Students are increasingly coming to expect more flexibility in learning options. Course developers need to take affective factors into account in order for learners to successfully engage in independent study. This can be done through awareness-raising, written comments from learning advisors or tutors, and ongoing questioning of learners to explore their feelings about the course they are studying. Sergio Valdivia was a learning advisor and instructor at the Self-Access Centre (SAC) at Universidad Verazcruzana in Mexico (Xalapa). His research interests included learner autonomy, the affective domain and self-access language learning. Sadly, Sergio passed away in October, 2010. David McLoughlin teaches at Meiji University in Tokyo, Japan. His areas of interest are motivation, attribution research and learner development. Jo Mynard is the director of the Self-Access Learning Centre and assistant director of the English Language Institute at Kanda University of International Studies in Japan. Her research interests are self-access language learning, learner autonomy, advising in language learning and CALL. She is the editor of Studies in Self-Access Learning Journal. Benson, P. (2001). Teaching and Researching Autonomy. Harlow: Pearson Education Limited. Mynard, J. (2010). Promoting cognitive and metacognitive awareness through self-study modules: An investigation into advisor comments. Proceedings of the International Conference CLaSIC 2010 “Individual Characteristics and Subjective Variables in Language Learning”, Singapore, 2-4 December 2010, pp. 610 – 627. Noguchi, J., & McCarthy, T. (2010). Reflective self-study: Fostering learner autonomy. In A. M. Stoke (Ed. ), JALT2009 Conference Proceedings. Tokyo: JALT. Schunk, D. H., Pintrich, P. R., & Meece, J. L. (2008). Motivation in education: Theory, research, and applications (3rd ed.). Upper Saddle River, NJ: Pearson/Merrill Prentice Hall. Valdivia, S., McLoughlin, D., & Mynard, J. (forthcoming). The portfolio: A practical tool for advising language learners in a self-access centre in Mexico. In J. Mynard & L. Carson (Eds.) Advising in language learning: Dialogue, tools and context. Harlow: Longman.